If passenger vehicle (PV) manufacturers were expecting the festive season to inject some level of fireworks in their sales, then their expectations have been belied. Having seen sales numbers accelerate hard in Q1 FY2019 (April-June 2018) with 873,501 units to notch 19.91 percent YoY growth, the segment was badly hit by sharply escalating fuel prices and an optically amplified negative growth all through Q2 (July-October 2018), caused majorly by the high year-ago base. Vehicle sales in July (290,960 / -2.71%), August (287,186 / -2.46%) and September (292,658 / -5.61) saw growth being highlighted by a streak of red, with factors such as mandatory bundled insurance premiums for up to five years, depreciating rupee and rising fuel prices impacting market sentiments further in the festive season. While the industry could have achieved better growth in what is usually a buoyant festive month of October, sales moderated to settle at 284,224 units to rise marginally at 1.55 percent (October 2017: 279,837). Industry registered cumulative PV sales of 2,028,529 units between April and October, registering modest growth of 6.10 percent (April-October 2017: 1,911,883). As a result, where most PV makers have seen a decline in their market share for the first seven months of the fiscal, Tata Motors, Toyota Kirloskar Motor and Maruti Suzuki India have been the key players to have maintained their performance and improved even in these troubled times. Market leader Maruti Suzuki India, which has seen its sales moderate sharply in recent months, saw its PV market share grow from being placed at 50.09 percent between April and October 2017, to 51.50 percent during the same period in the current year, to emerge as the bellwether of the Indian PV industry. The company’s overall sales grew from 957,603 units in 2017 to 1,044,749 units for the seven-month period in the current fiscal. With such a performance, albeit slowing down, it still looks well placed to reach its 2 million annual sales target by the year 2020. A robust performance by some of its key models, including the latest-generation Swift and Dzire twins, as well as the Celerio and Baleno hatchbacks made the company stick on a positive growth trajectory, even in a tough market. These compact cars collectively garnered sales of 517,204 units between April and October, registering a growth of 21 percent (April-October 2017: 427,726) year-on-year (YoY). Maruti’s UVs on the other hand, led by the Vitara Brezza, which was given a facelift in May, and also including the Gypsy, Ertiga and S-Cross, remained majorly flat at 2 percent, bringing in cumulative sales of 150,633 units in the period (April-October 2017: 147,630). The company is set to launch the new Ertiga MPV on November 21. Meanwhile, a hard-charging Tata Motors has made notable progress over the last seven months with its PV market share growing from 5.78 percent in 2017 to 6.84 percent between April and October this year, on the back of its escalating sales, which reached 138,732 units (April-October 2017: 110,415). Its Tiago hatchback and Nexon compact SUV have been the major growth drivers. While the entry-level Tiago and Tigor siblings went home to 81,498 buyers during the period, registering growth of 6.30 percent, the Nexon has catapulted the company into the fast lane, with handsome 28.5 percent growth coming on the back of 34,610 units. The stylish crossover has also aided Tata’s UV market share double from being pegged at 3.80 percent between April and October 2017 to 7.95 percent in the same period this year. Tata Motors has recently launched the power-packed JTP versions of its Tiago and Tigor twins, which promise fun-to-drive performance at a pocket-friendly price. Japanese major Toyota, with its Indian arm Toyota Kirloskar Motor, also saw its PV market share improve, albeit slightly, as it sold 92,169 units between April and October, to get a hold on to 4.54 percent of the market (April-October 2017: 4.20% / 80,364 units). While its Yaris sedan, launched in May, has cumulatively sold 9,810 units until October, couldn’t lift off in a segment having fierce competition from the Honda City and the Hyundai Verna, its highly popular Innova Crysta MPV (April-October 2018: 46,047) and the Toyota Fortuner (April-October 20187: 12,966) have been the key growth drivers. With sales of 8,828 units, Toyota’s Etios Liva hatchback too registered growth of 13.6 percent during the April-October period (April-October 2017: 7,769). American marque Jeep operating under Fiat Chrysler Automobiles India (April-October 2018: 9,753), and Ford India (April-October 2018: 58,082) also registered positive growth during the seven-month period under review and marginally enhanced their hold of the PV market to 0.48 and 2.86 percent respectively, Hyundai Motor India and Honda Cars India have lost market share. While the country’s second largest PV maker by volume, Hyundai Motor India saw an increase in sales with 326,178 units going home to buyers between April and October 2018 (April-October 2017: 314,052), its market share slightly dipped from 16.43 percent during the same period last year to 16.08 percent in the current fiscal. A bigger overall market size is the recent behind this result. While the Verna C-segment sedan recorded growth of 43.51 percent with overall sales of 25,293 units (April-October 2017: 17,624), its Creta SUV registered overall growth of 18.55 percent with overall sales touching 75,024 units (April-October 2017: 63,280). The Grand i10 and Elite i20 hatchbacks on the other hand, registered de-growth of 3.76 percent from 196,339 units in April-October 2017 to 188,953 units in the current fiscal. Hyundai now has high hopes on its recently launched third-generation Santro entry-level hatchback, which has already garnered over 30,000 bookings from October 10. 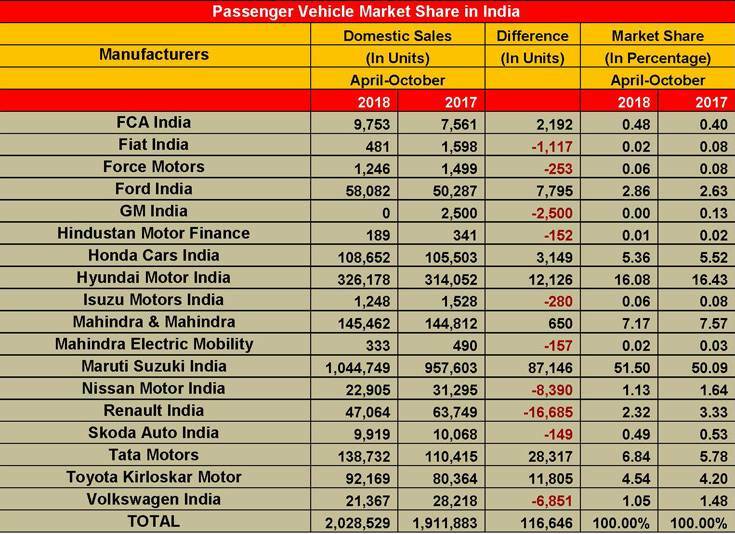 Honda Cars India too lost market share slightly, down from 5.52 percent between April-October 2017 to 5.36 percent. However, because of an increased overall market size, Honda’s sales grew from 105,503 units last year to 108,652 units. While its second-generation Amaze compact sedan, launched in May, has been an instant hit with buyers and has already surpassed the 50,000 unit mark in no time, its prime product – the Honda City sedan – has been seeing slower offtake and substantially declined 37 percent with sales reducing to 22,686 units (April-October 2017: 35,949). With fuel prices being on the higher side and customer sentiments remaining mellow during the festive season, the PV segment is only hopeful of good growth on the back of some of the much anticipated new models slated for launch early on in the New Year. While the industry could still push the accelerator pedal, how it fares in H2 of FY2019 is dependent on a lot of external factors such as commodity, oil and insurance prices. Watch this space.